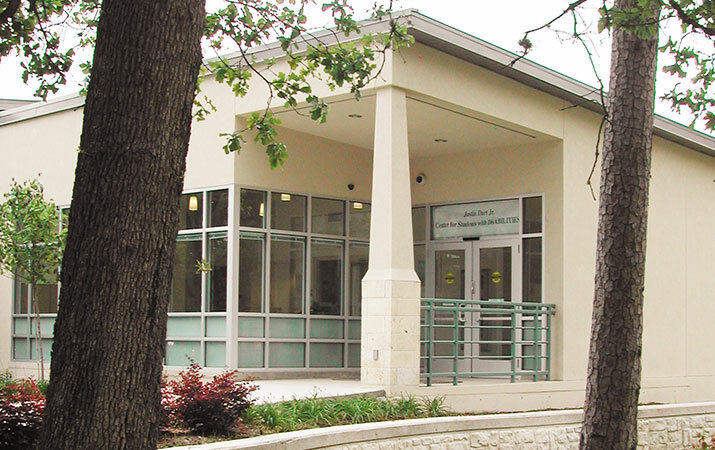 The Justin Dart Center for Students with DisABILITIES at the University of Houston, built in 2002, is the first stand-alone building on any American university campus to specifically serve the disabled community. Located amongst the student dormitories and health facilities of the campus, the Center houses services that assist disabled students in navigating the university. Rooms for test-taking purposes are sound-proof, light-controlled, and allow individual students to adjust the spatial environment to their needs. Staff coordinate medical and support services that enhance students’ educational experience at the university. The single-story building opens at the corner with a light-filled lobby that serves as a communal living room. The building comprises two opposing shed-roofed volumes that overlap at the central corridor. This geometry introduces light into the center of the building. The simple plaster exterior and metal roof establish a quiet but significant presence for a place that has become an important center of student life on campus.